…and you realize you need new bedding. 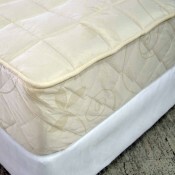 Your old bedding has just served its time. It's kaput. 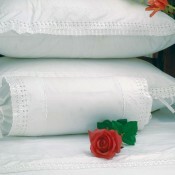 Turn your bed into something dreamily other-worldly with our Classic Victorian lace. Your choice between white and off-white and awesome designs. 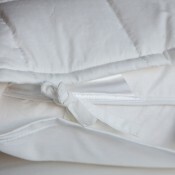 We are able to embroider any logo, picture or monogram onto your linen, in any colour. Contact us for more info. Here are a few pointers for you on why Makoti. · As a family business, we just give you more attention. The big shops can’t. · After Services always available. Remakes, washing and sterilizing. Always! · 30 years of hands-on experience. This makes us experts with expert advice. You can trust us. · All material hand-sourced from around the world giving you just the best money can buy. 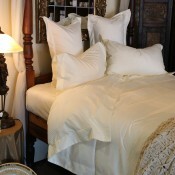 Makoti offers only the best quality percale cotton in a variety of colours...all neatly edged with a.. This Baby digs Bears :-) This unique Baby Duvet Cover Set includes one embroidered Duvet Cover.. The Makoti baby range is made with care especially for the comfort of your baby. Our checkered..
Make your bed a feast for the eyes! Choose from our available Colours and all our Unique Health Pill..